Zirakpur is a popular town in Chandigarh that has a lot to offer its inhabitants. Filled with a peaceful and harmonious atmosphere, there a lot to this town other than what meets the eye. The real estate sector in Zirakpur has stepped-up over the years with a number of residential as well as commercial projects today. The Hermitage Park is a new residential project in Zirakpur, Chandigarh that offers a modern-day lifestyle of immense luxury. Extended over 9 acres of luscious land, this residential development contains sophisticated towers that offer 2BHK and 3BHK Vaastu-compliant luxury apartments of different configurations that will satisfy our senses. With apartment area sizes starting at 1257 sq. ft. and going up to 1945sq. ft., making way for beautiful space that will fill your heart and mind with gladness. The apartments are well-spaced and contain premium furnishings and fittings, ambient lighting, high-quality flooring, tough doors and large windows providing beautiful views, elegant kitchens with laminated cabinets and granite tops, electrical ports located perfectly for convenient access, hi-tech safety features and this list goes on. Pure divinity is what you will find in every apartment. This development offers a range of world-class external amenities that will blow your mind. The external amenities include a massive clubhouse of 15000 sq. ft., well-equipped gymnasium, swimming pool with deck, jacuzzi, gazebo, large central podium with waterfalls and beautiful lawns, sit-outs, multiple sports facilities and a play area for your kids, multipurpose hall, café, landscape garden, efficient car parking, power back-up, high-end security and a lot more. Without a doubt, there is something for you and every member of your family at this development. 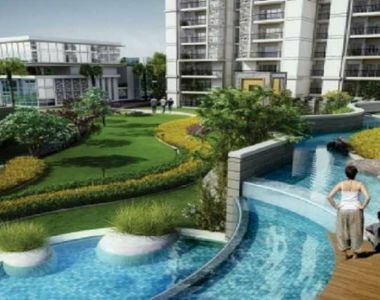 Located at Zirakpur, Chandigarh, The Hermitage Park Zirakpur comes in close proximity to a number your everyday and emergency places like schools, universities, malls, shopping centers, restaurants, cafes, pubs, cinemas, banks, ATMs, medical centers, hospitals, all kinds of public transport and a lot more. Experience a new life of convenience that will delight you each day. This development is high on luxury, but low on cost! The Hermitage Park price is affordable and will fit your budget perfectly. You can conveniently choose from multiple payment plans along with home loan facilities through associated banks, NRI services and a lot more for a hassle-free purchase. Seemless connectivity to major highways is an added advantage to residents. Open-air corridors and naturalistic walkways provide unique perspectives.